MISS 3: "The Memetics of Cerita Silat"
Cerita Silat, a genre of modern heroic fantasy, became one of Indonesia's most widely read forms of popular fiction in the decades following independence. 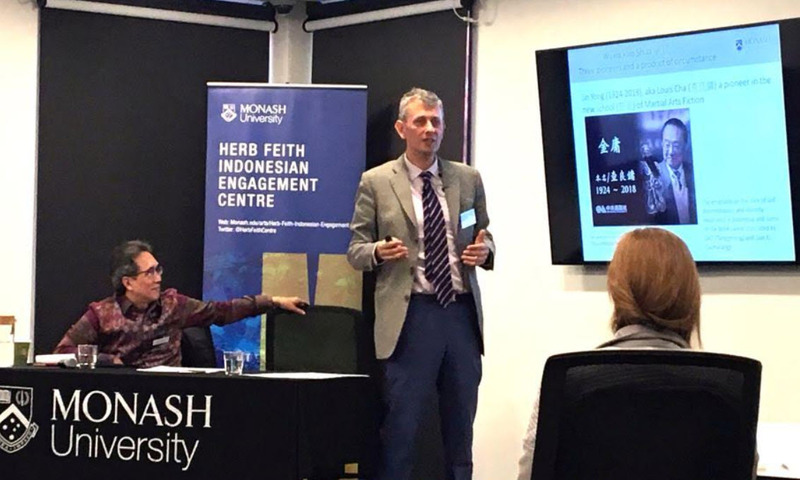 Its history and the reasons for its huge popularity in Indonesia were the subject of analysis by Prof Buckingham in our Monash Indonesian Seminar Series, on April 11, 2019, attended as usual by an audience that packed in Room T1 of Sir Louis Matheson Library, Clayton Campus. In his talk, Prof Buckingham focussed on two "giants" authors of Cerita Silat, Kho Ping Hoo and S.H. Mintardja. Using memetic theory, Prof Edward showed the literary migration of Chinese martial arts fiction or Wu Xia Xiao Shuo, which was made popular in Indonesia by way of translation and its role in the development of locally produced Cerita Silat. Edward Buckingham is Professor of Management and Director of Engagement at Monash Business School. He graduated with a BSc in Materials Science and a BA (Hons) in Indonesian Literature from Monash University and was Monash University’s first undergraduate exchange student to Indonesia. Edward continued with post graduate studies in China at the Johns Hopkins Nanjing Centre. He also holds an MBA from INSEAD and his PhD, from the School of Oriental and African Studies, University of London, was an ethnographic study of organisational boundaries and business strategy in Indonesia.